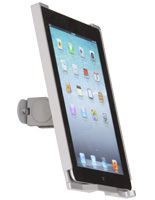 What is the best use for these wall mounted iPad holders? 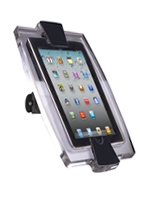 These tablet holders for commercial use are popular with retail outlets, but have tons of other applications. 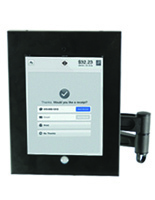 These iPad wall mounts, also known as smart technology kiosks, make presentations about your company visible to customers. 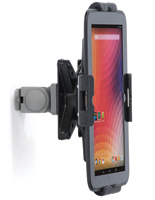 These tablet dock stations make secure not only your data but also your device. These iPad wall mounts have a bracket that holds 2nd, 3rd and 4th generation tablets. 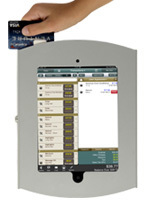 These displays can be placed around a store to highlight specific categories of merchandise. 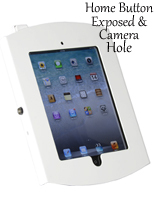 These iPad wall mounts, such as technology devices can be placed in areas of heavy foot traffic. 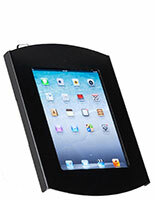 These enclosures are made of ABS plastic and have a contemporary black finish that melds with any décor. 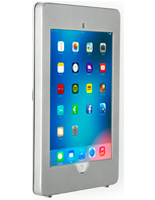 These iPad wall mounts, especially vertical hanging models, can be rigged to allow users Internet access for comparison shopping. The home button can also be blocked should a merchant not want to give visitors that option. 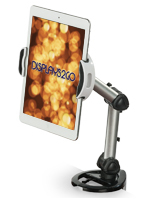 Download interactive advertising presentations on these iPad wall mounts to intrigue visitors. 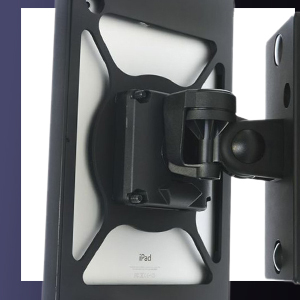 Made and designed in the United States, these Apple® dock stations have a 270° rotation and a 90° tilt.These iPad wall mounts, like a bracket unit will no doubt boost sales immediately! 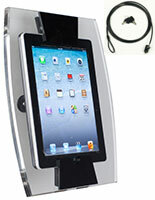 A tablet kiosk allows hands-free use of your touchscreen. 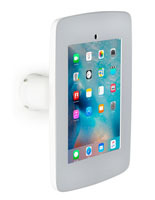 Each of these iPad wall mounts presents customers with a more interactive way to shop. Merchants feel secure letting customers access presentations via dock solutions. 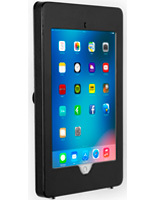 For safety reasons, these iPad wall mounts are designed with molded plugs that can cover the home, power, volume buttons plus he audio jack port. 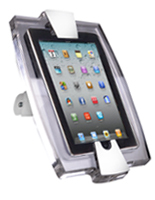 These holders, such as dock systems are hung vertically, leaving open space on the floor or on countertops for products! These enclosures are exceedingly popular in retail showrooms. These bracket displays can be seen used as corporate park directories, in libraries, museums, art galleries, grocery stores, and food associations. Engage customers immediately with technology to support human resources in your store or showroom. 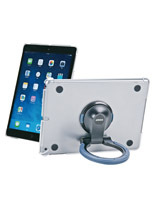 These ®Apple® touchscreen holders are a great way to connect with your clientele when you're busy waiting on customers. 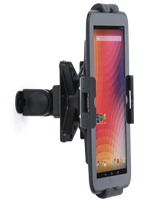 Protect your smart technology with these supporting supports. These units don't cost much up front and they are exceedingly cost effective over time. Important data stays secure with safety plugs that cover ports where tampering could occur such as at home button or volume buttons. Some merchants choose to leave some ports on these bracket models open to allow visitors to do comparison shopping. Use will vary from business to business but any setup is possible. These units are displayed vertically, opening up floor, desk and counter space. This feature is great for high-traffic areas where space is at a premium! 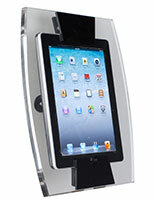 These super-functional kiosks are compatible with ®Apple® 2nd, 3rd & 4th generation ® only. Special hardware and a screwdriver is included in the shipment for your convenience! Which business venues are these Apple® kiosks best suited for? 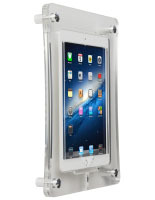 These kiosks come with foam pads inside the cradle to prevent your device from being jostled and scratched. These units adhere to a vertical surface that saves space on the showroom floor or countertop. 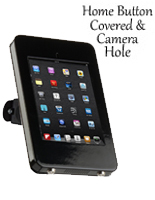 These touchscreen devices are fastened to them with (4) hex screws for security. 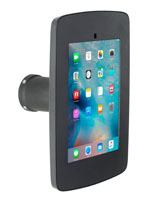 For extra safety, purchase a Kensington lock adapter kit separately from this web site. There is a hole in the back of the unit designed to thread the lock through. 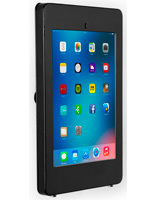 Your technology is protected from scratching due to built in buffering pads. These touchscreen kiosks come with a push-lock mechanism so it doesn't have to be purchased later on.